Other than roofing failures, the single-most common source of any moisture entering a home is the failure of the installed siding material. In the state of Colorado, most construction siding that has been used was lap siding. However, stucco finishes are being used in more new homes all the time. Additionally, refinishing an exterior with stucco is an increasingly popular choice due to its strength and its low maintenance needs and upkeep requirements. Regrettably, stucco siding systems do leak when damaged, whatever the cause. Fortunately there are many stucco repair options available. Why Do So Many Builders Use Stucco? Stucco’s popularity in America started in the early Nineteenth Century since it was a cheap yet effective way of providing an exterior wall covering to stone, brick, or concrete. In modern times, stucco is just a cheap way of applying a surface over an on open frame construction instead of stone or brick. “Open frame” simply means that a paper and lathe reinforcement that looks like chicken wire gets laid out over wood-framed walls free of sheathing. They are then coated with a trio of plaster applications. It’s cheap, but it has its risks and drawbacks. Pretty much every stucco leak out there can get traced back to application errors or mistakes. Errors happen when there is inappropriate overlap (or flash) of components like windows and paper with the items underneath them. Leaking can also happen when paper or flashing degrade from age or excess moisture. Keep in mind that the majority of stucco leaks aren’t going to show up on your unit’s interior. There’s a half-foot space between stucco and your interior’s drywall, and this space is full of fiberglass padding and wood framing, all of which holds quite a bit of water before anything is visible in the interior. If this happens, count on mold, termites, and dry rotting to follow suit. Window leaks within stucco walls are one of the more common flashing failures that happen in building structures involving them. Two primary sources account for most leaks. The first is the failure of the actual window frame mechanisms. The second is improper lapping of the protective paper system of the stucco onto the surrounding window flanges. 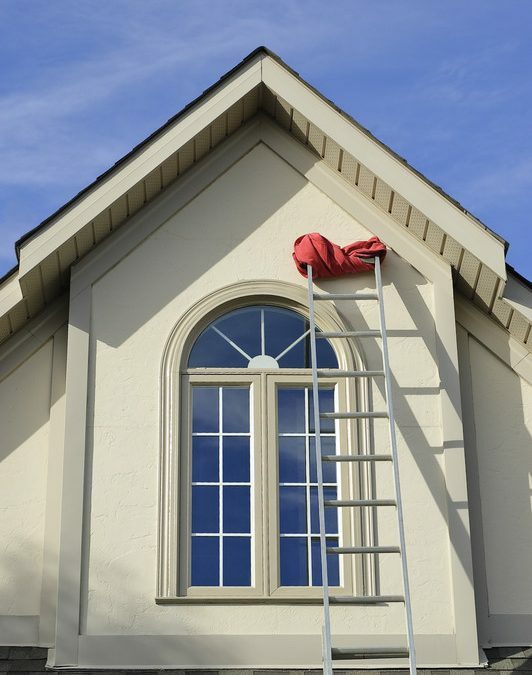 Common repair work involves rehabilitating the window frame or removing the stucco surrounding the actual window in order for a proper application of a paper flashing system. Light fixtures, electrical outlets, hose bibs, vents, and other miscellaneous wall penetrations in stucco surfaces all create flashing problems when construction is still happening. Many of these simply don’t have the right flanges to fully overlap the paper flashing appropriately, nor are they usually properly sealed in the construction phase. Many builders in the past made a common mistake of terminating the paper protective systems at points of the trim wood fascia board that was located underneath the roofline. When wood ages, it shrinks and then splits, letting moisture get behind the wood and then into the wall itself. A number of properties have retrofitted fixtures, windows, and doors, or even repairs that were done after the initial construction. When surrounding stucco is patched, then the newer flashing paper often gets incorrectly overlapped. It’s also possible that the older paper is to brittle and overly damaged to the point that it’s impossible to do overlapping properly. When new plaster settles or cracks due to the improper fastening of its wire reinforcement, water is able to find its way through that plaster and paper, creeping into the wall’s cavities. Stucco walls quite often exhibit cracking at places like doors, windows, or just open-field areas across the wall. Cracking is not necessarily indicative of failure or a weather-protection system, but any increase in exposure to air-borne pollutants and rain water will cause affected paper to rot prematurely. Eventual failure then allows for the intrusion of moisture. There are often stark differences between the costs of stucco repair options, so it’s essential that you get a professional stucco repair expert to diagnose your particular issue and then design and implement an effective, affordable solution. The most commonly used kind of stucco repair options involves the removal of stucco sections from around flashing transition areas or windows. New flashing is applied along with plaster and wire reinforcement. This technique typically requires intensive and meticulous labor during both the demolition and reapplication processes. Doing this work correctly does take some time, and that’s just why this particular method has the highest individual failure rate of any of the three options covered. A poorly done rebuild is one where the new paper flashing isn’t entirely lapped underneath the old paper’s salvage edge. This often means the compromise of the lathe wire reinforcement. The very nature of the actual underlying flashing system makes troubleshooting leaking in stucco walls difficult. However, water testing often provides very effective results. This kind of testing actually has a 95-percent success rate in testing failure points behind stucco. Stucco is unlikely to go anywhere anytime soon. We’re all going to face the prospect of stucco in the next homes we move into. Luckily for all of us, new homes are being constructed with higher levels of care and better standards. However, when leaks inevitably happen, it’s critical that the repair method is simultaneously affordable and effective.